Thimble. Needle. Thread! There’s beauty going on both on and off stage at the Central Pennsylvania Youth Ballet as the wardrobe department prepares 139 individual costumes that appear during Alan Hineline’s epic three act The Sleeping Beauty. 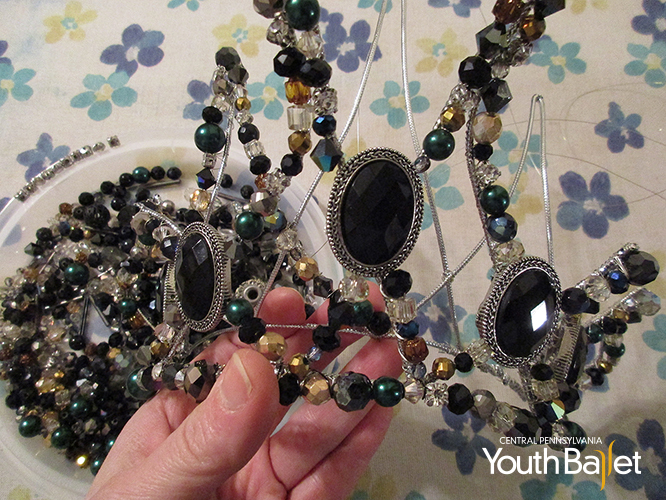 Many of the ballet’s costumes consist of multiple garments, accessories, and a headpiece to complete the look. The sheer volume of pieces appearing on stage can be daunting enough. However, an even more challenging task for the wardrobe crew is the fact that many of the roles are danced by different dancers in turn during the run of the show. 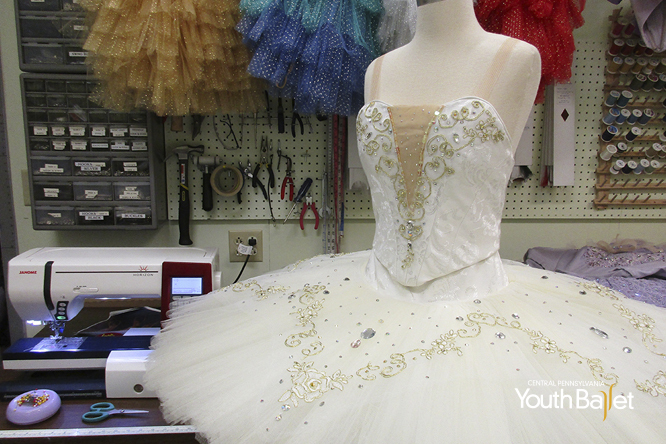 Countless fittings have gone on since February to ensure that each dancer looks his or her finest. 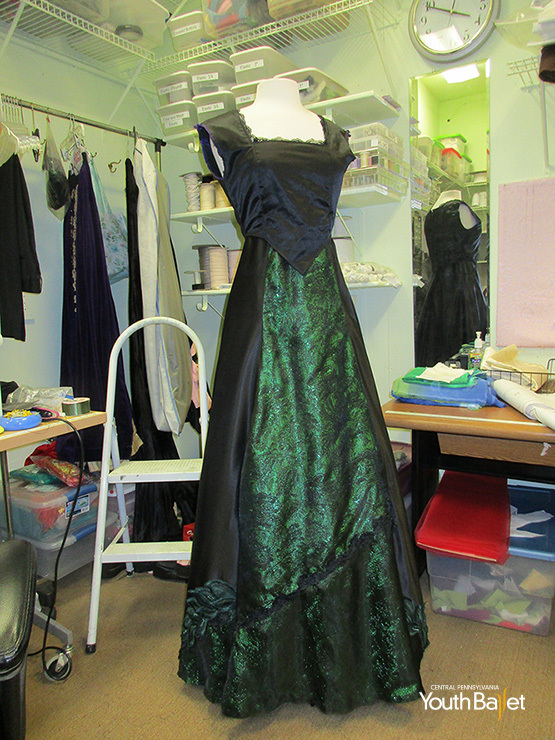 Keeping the production fresh and new, the 2017 production of Hineline’s The Sleeping Beauty will sport a newly envisioned Carabosse costume and two redesigned Princess Aurora tutus, as well as a new outfit for the Prince of the North. The Fairy Carabosse has received a new look to better fit her status as a fairy gone astray. The wardrobe department dismantled the existing costume, changing the lines to match the sweeping curves of the Tudor-inspired royalty that inhabits Central Pennsylvania Youth Ballet’s production. The Fairy Carabosse new skirt and stripped bodice. A newly hand-designed tiara with more than 350 gems completes the look. Now bedecked in satin, lace, chiffon, organza, metallic brocade, and opulent trims, the magnificently wicked Carabosse expects to turn heads this year, hopefully, never to be left off a guest list again! As the title role, the Sleeping Beauty herself won’t be left off the best dressed list. This year’s audiences will delight in seeing the Princess Aurora in new costumes for both her birthday and wedding scenes. 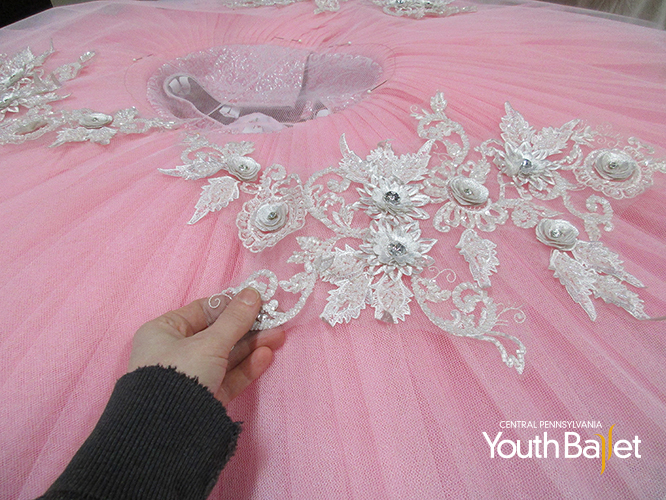 Both of Aurora’s costumes consist of a bodice and tutu custom made in house by the Central Pennsylvania Youth Ballet wardrobe department. 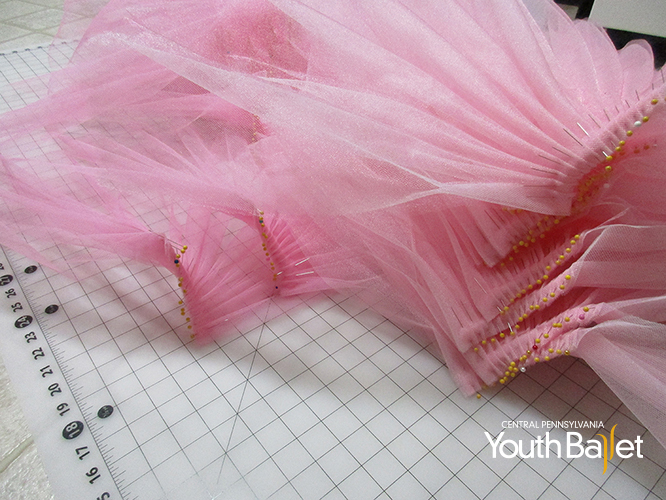 Central Pennsylvania Youth Ballet Princess Aurora Birthday tutu net pleated. Each of Aurora’s 10-layer tutus contains 20 yards of net. Each piece is hand scalloped and the top three rows are double-hand pleated. 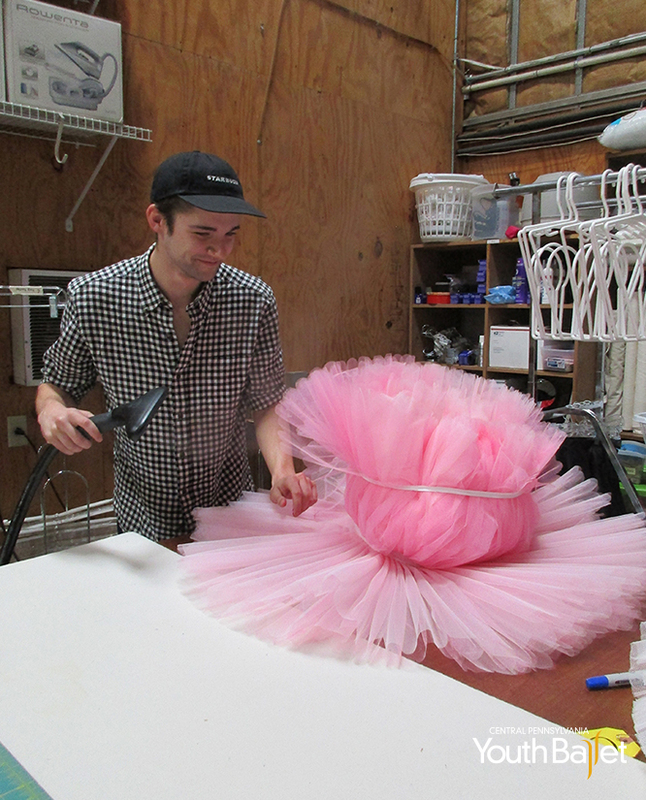 Central Pennsylvania Youth Ballet wardrobe crew steaming Princess Aurora’s Birthday tutu. The details of each costume speak to the emotional journey of the character. The birthday tutu is light and girlish: a vision of delicately frilled, perfect pink. The wedding tutu announces a Princess Aurora elegant and poised. Hand sewn embellishments complete Princess Aurora’s Birthday tutu. Alas, the costume for one of Aurora’s four suitors who dances with her in the famous “Rose Adagio” failed to “awaken” from storage. No kiss from the wardrobe staff could revive it. The fabric had degraded and was riddled with too many holes to be included in this year’s grand work. So the costumers set to work creating a new one. 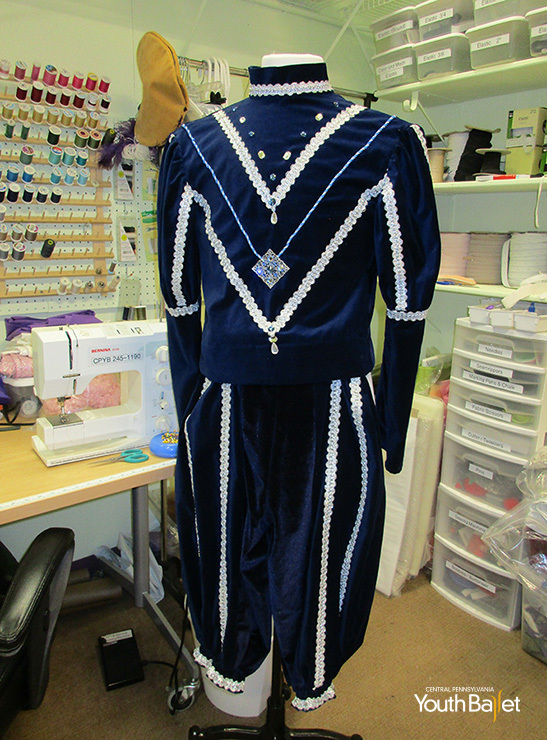 Three yards of rich, navy velveteen and 12 yards of silver trim later, the Prince of the North is again ready to woo the Princess. Melanie Ortt developed an interest in costuming as a choreographer who could never find quite the right costume in the existing costume closet to match her vision. After many inadequate attempts to make pieces for her dancers from scratch, in 2014 she attended her first Tutu School seminar hosted by Claudia Folts of Tutu.com. Since then, Melanie has been engaged in making costumes for The Governor’s School for the Arts, Todd Rosenlieb Dance, Virginia Ballet Theatre, and the Lakewood Ballet Company.